I learned to embroider as a young girl, and remember watching my grandmother do beautiful work on pillow cases. I remember getting my first embroidery hoop and being excited to start doing my own free-hand embroidery work on pieces of cotton fabric. I still enjoy embroidery, and started teaching my daughter to do hand needlework a couple of years ago. What seemed to be a lost art is quickly seeing a new revival these days. Having the opportunity to review Judith Baker Montano’s Embroidery & Crazy Quilt Stitch Tool was something I was really looking forward to. I’m always looking to expand my library of hand-stitching books and tools, and I’m constantly looking for new ways to embroider. I was especially interested in learning how to use ribbon in embroidery, which is something this tool shows how to do. The Embroidery & Crazy Quilt Stitch Tool boasts over 180 stitches and combinations, tips for needles, thread, ribbon and fabric and illustrations for left and right-handed stitching. The book also has a nifty easel feature so that the book stands up for easy use. As soon as you flip open the book, a Stitch Guide is included to know which fabrics work best with certain threads/yarns and their respective needles. Flip a couple pages in and you’ll find a Stitch Index completely alphabetized with illustrations for easy identification. Next, you’ll find a handful of pages with tips and tricks for stitching, fabrics, frames/hoops and more. If you were doing these stitches for the first time or just needed a brush-up on how to do it, you simply go to the alphabetized stitch index at the front of the book and find the stitch you’re looking for and then turn to the page number shown under the stitch. On each page, you’ll not only find the instructions, but there’s an up-close shot of the stitch in a thumbnail-sized photo from an actual stitched project. I’m right-handed, but knowing some lefties (my son also happens to be a lefty), I know how hard it is for them to find instructional books that show left-handed diagrams. It’s a huge plus that this book included both left- and right-handed instructions and diagrams. From there on out, you’ll find all of the stitches until you get to the end of the book and find the combination stitches diagrams. I like to stitch on unusual fabrics. I chose to use the bottom of a pair of jeans that I had taken in for a friend of mine. It was perfect to make a little purse out of. I started out by doing one of the stitch combinations from the back of the book using stitches I already knew how to do. This stitch combination uses the chain stitch and french knot. I used a white marking pencil to draw a wavy line across the piece of denim so that I would have something to follow as I stitched. I added chain stitches for the blossoms an light purple french knots for the little flower buds. As you can see, my stitching very closely resembles the stitch combination shown in the book. Next, I started going through the stitch index to pick out some stitches I either hadn’t done in a while or that I had never done before. I chose to go with the Lazy Daisy Double stitch. While I’ve done lazy daisies before, I never thought to do a double. I stitched my row of light purple lazy daisies to create flowers along the top of the soon-to-be purse. Then, I stitched a dark purple lazy daisy around each to finish off the double stitch look. Because I do a lot of my stitching free-hand (without drawing out guide lines to stitch along), I realized that my flowers were open in the middle. I filled in with some bright yellow french knots to create some really cool textured flower centers. My next step was to create some leaves and vines so I used a back stitch for the vines. Then, I looked at the book’s stitch index and picked out a leaf stitch for the vine. I chose the Fishbone stitch (one that I haven’t done in ages). I used my white marking pencil to draw out the leaf outlines. The outline made stitching well-balanced leaves a breeze. Along the bottom of the purse, I did another of the stitch combinations, but tweaked it up a bit to include a Colonial Knot, and used back stitching instead of the curved buttonhole stitch that it called for. I had a bit of trouble getting the Colonial Knot down (I’d never done this stitch before) and this is where I found that my visual learning skills needed just a bit more than a diagram. With most stitches, I can usually figure them out with a little bit of time along with the diagram. The colonial knot, though, took me a good 15 minutes and about 10 tries along with cutting the floss and starting over and over again. Once I got it down, though, I found it very easy. This is where I could have used just a couple more steps in the diagram to make it easier for my learning style. I stitched the bottom of the pant cuff up and added a couple of light yellow grosgrain ribbon handles to finish the purse off. It was then on to the ribbon embroidery. I’ve always loved what I’ve seen done with embroidery and ribbon and have wanted to try it. Using the Embroidery & Crazy Quilt Stitch Tool was a great way to start. I bought some yarn darning needles for the ribbon embroidery. Yarn darning needles have bigger eyes which make it easier for fitting ribbon through (chenille and tapestry needles are also good for ribbon embroidery). I chose some silk-type ribbon to use for my project and some thin satin ribbon, as well. I chose a piece of cotton patterned fabric and put it into an embroidery hoop which is something I don’t use a lot, since I tend to do better with holding my fabric in my hand as I go along. Since I was working with ribbon and the stitches were a little more unforgiving, I went with the embroidery hoop. Using the book as my guide, I created some beautiful ribbon flowers and leaves (Couched Rose, Jan’s Antique Rose, Five-Petal Gathered Flower, Freeform Flower and Japanese Ribbon Stitch). I really like that some of the stitches use other stitches as their foundations, so once you have one down, you’re already half-way there on learning another stitch. Two of the ribbon flowers that I liked creating the most were the Freeform Flowers and the Five-Petal Gathered Flowers. The diagrams were very clear and I loved the way they came out. I can see myself making more of these for other projects and not just on fabric projects. I will definitely be making more using a lot of the different width ribbons that I have and putting them on scrapbook pages, shadow box art and mixed-media creations. I added some small faux pearls that I found in my grandmother’s old button tin for the centers of my small flowers. After I added a bunch of Japanese Ribbon Stitch leaves, I used a ball point pen to very lightly write out the words I wanted to stitch on my project. I used a back stitch to embroider the words. I readjusted my fabric, tighted the screw on top of the hoop and trimmed away the extra fabric from the back and I’m totally impressed with myself and the way my project turned out. For my first try with ribbon embroidery, I’m very pleased, and have found myself hooked on ribbon flowers. The Embroidery & Crazy Quilt Stitch Tool retails for $22.95 from C&T Publishing. You can also purchase an e-book for $17.99 and a Book + eBook bundle for $27.99. If you’re a very visual learner, some of the more complicated stitches might take you a little longer to master despite the illustrated diagrams. The price could be off-putting for some, but when you price it out, it’s only 13 cents per stitch tutorial! It was really hard to find cons for this product; I found it very well put-together, comprehensive and exhaustive. It’s a book that I’ll get a lot of use out of and it’s something that I can share with my daughter as I continue to teach her the beautiful art of embroidery. Have you used C&T Publishing’s Embroidery & Crazy Quilt Stick Tool? Where do you find your stitching inspiration? Leave us a comment and let us know! As a mixed media artist, I’m always on the lookout for new media to use with my creations. I was excited to try out C&T Publishing’s Lutradur Mixed Media Sheets. The packaging describes it as a versatile cross between fabric and paper. According to the website, it’s a “fabulously versatile non-woven fabric. You can cut it, sew it, paint it, print it, stencil it, stamp it, pleat it, dye it, distress it, draw on it, die-cut it, punch it, sculpt with it, bead it, do gel transfers onto it, weave it.” That description totally fascinated me. When I received my Lutradur sheets, the first thought that went through my mind was that it reminded me of heavy-duty type of interfacing that one would use in sewing. There are two different weights of Lutradur in the package. They are 8.5 x 11 inches in size and there are five regular sheets (70 gram) and five heavyweight sheets (100 gram). While I don’t own the book, “Fabulous Fabric Art with Lutradur” (by Lesley Riley), there are a lot of great pictures on the back of the packaging of the Lutradur sheets to get your creativity going, as well as some cool ideas on Lesley’s site. Lesley also has some videos up that show how she uses Lutradur sheets in her own creations. I tried a variety of different techniques and projects with my Lutradur sheets and have found myself quite addicted to them now. For my first project, I created a canvas project and used my die cut machine to cut shapes out of the Lutradur. At first, I tried the skinnier Sizzix die (also known as Sizzlits). The first run through the machine didn’t even cut into the Lutradur. I put about 4 thin shims on top of the die and ran it through again and while it cut through the Lutradur, it wasn’t a clean cut and I had trouble breaking the die cuts away from the Lutradur. Next, I tried one of the biggest dies from Sizzix (the Beauiful Butterflies die from Stampin’ Up – one of the Bigz Dies) and had flawless cutting. I tried a few layers on the die at once and they cut beautifully. I used Shimmers Spray to color the butterflies. The ink from the spray turned a bit lighter after they dried, but they had such a delicate look to them with the fibers of the Lutradur. I wanted to see if the Lutradur would hold an embossed impressions so I put the butterflies into different embossing folders and ran them through the Big Shot and I love the texture that it resulted in. I found that the thicker sheets of Lutradur had a very pronounced embossed effect while the thinner sheets held the embossed image, but it wasn’t a pronounced as it was on the thicker sheets. I decorated a canvas to put my butterflies on so that they resembled an entomologist’s display board. I used large safety pins for the body of the butterflies by adding beads and weaving the pins through the center of the butterflies. I then used high-temp hot glue to secure my butterflies to the canvas. My daughter brought this canvas as a gift to a friend’s birthday sleepover and it was a huge hit all around! My next project included using the Lutradur in my sewing machine, printing on it in my ink-jet printer and distressing it. Because the Lutradur sheets are sized at 8.5″ x 11″ inches, they fit in a printer perfectly. I used a thicker sheet (the heavyweight, 100 gram sheet) in my printer to print a picture of the Eiffel Tower on it. The printing went perfectly. I used a pair of decorative scissors to give the edges a bit of a vintage and worn feel. Next, I used some Shimmer Spritz to add a bit of distressing to the image. Because I used an ink-jet printer, my image started to bleed and it lost its detail. When it finally dried, it had a blurry and hazy look to it, but I could still tell it was the Eiffel Tower. I chose some embellishments to add to it so that the blurry picture would be complimented by them. I sewed together a couple pieces of fabric with two pieces of denim inbetween (I didnt have any batting, so I cut a couple pieces of denim from an old pair of jeans that I had used parts of for another project) to create the cover of an artist’s journal. I pinned the Lutradur on top. I then sewed the Lutradur onto my journal cover with my sewing machine. I ran my embossing gun over the Lutradur to give it a bit of a worn feel. I came to realize that using the embossing gun on Lutradur is one of my favorite techniques. I love the texture that happens when the Lutradur is melted, twisted and turned with the heat from the gun. I tore some pages out of an old book that I got from the discard pile at the library (I think the librarians would shudder if they found out all the crafty things that I do with the books I get from their discard pile) and sewed those into the inside of the journal cover with a piece of Lutrador that I had printed as a sample with a picture of the Eiffel Tower on it. These pages will be used to paint on, sketch on, journal on, etc. My next project was to experiment a bit more with the embossing gun on the Lutradur and to do some beading on it. Beading was one of the uses for Lutradur that was advertised on the packaging so I wanted to try it out. I cut a piece of thick Lutradur in half using my paper cutter. Cutting with the paper cutter was efforless and it cut just as easy as any piece of cardstock would. There was no fraying at all. Just a clean cut. I used my embossing gun to melt and shrink the pieces of Lutradur down. The effect that I got was a really pretty tattered and textured look. The Lutradur took on a harder feel to it after it was melted with the gun and that made it even more sturdy. The sturdy feel of the Lutradur was perfect for beading. My grandmother recently sent my daughter a little baggie with a couple of fake pearl necklaces that had broken, along with a couple of maroon bows. She figured that my daughter would come up with some sort of craft project to use them on. Instead, I took the beads and bows and made something for my daughter out of it. I used black thread (so that it would blend in with the background of the little purse I was making) and threaded the fake pearls on. I did the beading on both pieces of Lutradur that I had cut and then sewed them to the front and back panels of the little purse that I created. I recently took up some pants for a friend’s son and I saved the pieces that I cut off the bottom of the pant legs because I knew they would come in handy for a project – I turned one of the pants cuffs into a purse. I added a couple of Lutradur handles to the purse and used my embossing gun to melt them and sturdy them up a bit. I added the two little maroon bows to the front where the handles ended. Voila! An upcycled purse that uses the cuff off a pair of pants, fake pearls from broken costume jewelry, a couple miscellaneous bows and some melted Lutradur. For my last project, I wanted to try dying some Lutradur to see how it would take inks. I cut a bunch of circles of different sizes using my die cut machine and the Sizzix Circle #2 die. I then put a little bit of water in some bowls and added some re-inkers (used for re-inking stamp pads) and stirred them up. I dipped the Lutradur circles in the water and sloshed them around a bit to fully soak the circles. I put them all out on a piece of poster board to dry. (I also cut some circles out of old book pages – gotta love that discard pile at the library – and dyed those with ink, as well). I then ran my circles through my sewing machine to create a fun and colorful garland. This garland can be strung up on a wall, across an archway or doorway, along a mantle, as well as wrapped around a tree or bush. To keep it all in one place, I wrapped it around an empty glue bottle that I had hanging around. This keeps it from getting it all tangled and ready to hang up in the next place I want to add some color. The final color and intensity you get with dying Lutradur will depend on the kind of ink that you use and how much of it you use. While I was dying my circles, I found that the color was too light, so I added more re-inker to the water. I tried alcohol inks, but found that some of the inks didn’t want to fully disperse in water and beaded up on the Lutradur so dye-based inks worked better for a dye bath. Can be used in a multitude of ways – sewing, cutting, printing, etc. Can hold a lot of different artist’s media – gels, paints, inks, etc. Not easily found in most big-box craft stores. I called around to the different crafting stores in my area (7 stores in all) and only one store carried this product (a high-end fiber and quilting shop). The upside is that it’s easily found online. Honestly, I found the con list so inconsequential and just loved working with this product! 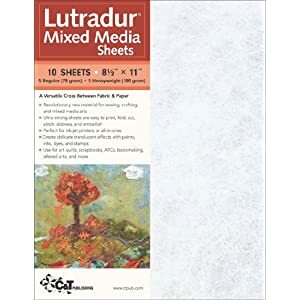 Lutradur Mixed Media Sheets can be found on Amazon for $9.95 (10 sheets, two thicknesses). C&T Publishing also carries Ultra-Light Lutradur (25 grams – $9.56) on Amazon. Though I personally didn’t have the opportunity to work with this product, now that I’ve tried the other two thicknesses, I’m definitely interested in trying the ultra-light out. If you’re looking to expand your crafting library and learn 27 techniques and 14 projects with Lutradur sheets, Lesley Riley’s book, “Fabulous Fabric with Lutradur,” can be found on Amazon for $14.25. Have you tried Lutradur Mixed Media sheets? How do you use them? Leave us a comment and let us know! When I cut a circle, I want perfection. I don’t want there to be any bumps where there shouldn’t be. I don’t want jagged edges or an oval. I want a circle – a perfect one. But that’s been hard to do on my own. I’ve used a protractor when I need an exact size, but the cutting doesn’t always go as I planned. I’ve traced around plates, bowls and cups and the results have never been quite what I wanted. Having the opportunity to review the Olfa Rotary Circle Cutter was something I REALLY wanted. Let me tell you….Mama likey! When I first looked at the cutter, I was stumped as to how something so simple looking could cut circles. It almost seemed too good to be true that there weren’t a million pieces or a large glass cutting mat or big circle apparatus that I needed to use. For real? Just the simple ruler handle, blade, ratchet and spike? No way! It couldn’t be that easy. The Olfa Rotary Circle Cutter cuts clean and perfect circles from 1 7/8 inch to 8 1/2 inches every time, and it can cut through multiple layers. It has a ratchet mechanism on it for easy turning so you can cut in one smooth movement. The blade is protected by a built-in blade cover for safety and the pivot spike also has it’s own plastic guard for when it’s not in use. The cutter is designed with both left and right-handed users in mind as well as being designed to reduce wrist fatigue when it comes to needing to cut a multitude of circles for quilting patterns. According to the packaging, the Rotary Circle Cutter can cut cloth, leather, paper, vinyl, film, wallpaper and more. Best of all, Olfa guarantees their handles forever. The Olfa website has a video demonstration to show how to use the cutter which was so helpful for me, seeing that the packaging only had a small picture on the front that served as instructions (though it did give the web address of the site on the back of the package for viewing a product demonstration). You can also find a PDF file that shows how to change the blade on the Rotary Circle Cutter on the website. The video demonstration actually made more sense on how to change the blade than the PDF did, though. I took on a really big project for my first try with the Rotary Circle Cutter. My first quilt. Yes, you read that right, this was my first quilt. Quilting has always intimidated me due to the fact that all of the pieces have to be cut and sewn with precision and paper has always seemed to be more forgiving to me. I love sewing with patterns, but quilts scared me. When I thought about a way to use the Rotary Circle Cutter, I thought how easy it would be to make a quilt top with appliqued circles. So that’s exactly what I did. Here’s a quick video I had my daughter take of me cutting out a circle using the cutter. One thing that I wish the ruler on the handle had is numbers that mark the inches and centimeters and in between. it can be a bit confusing when measuring. I took care of that for myself by using a fine paintbrush and acrylic paint to mark the inch marks. I had so much fun moving the measurement slide back and forth without having any certain sizes in mind. This was a great way for me to get used to using the tool without having to be so precise. I cut all different sizes and went through multiple layers of fabric to make the cutting quicker. Here’s the pile of circles that I cut out. I decided to do a lap quilt since it only required cutting twice on some yardage of 45″ fabric. I left the selvages in place since they were narrow and would eventually be hidden by the side seams. I spread my top piece of fabric out on the floor and arranged the circles until I got the look I wanted and then pinned them into place. I then appliqued all of the circles using a zig-zag stitch and going for a primitive look (my kind of quilting) by not worrying about making sure the zig-zag stitched precisely on the edges of the circles. When the quilt is eventually washed, the edges of the circles should fray nicely and give it a homey look. Because I don’t have a long-arm quilting sewing machine, I went even further primitive and used a needle and embroidery floss to tie off the quilt so the batting wouldn’t shift. I remember one of the quilts that my mother made when I was a little girl and loved looking at all of the little knots on the quilt that she used to tie it off. The Rotary Circle Cutter was a great way for me to use up my scraps for this quilt and I’m so pleased with how it turned out. The plan is to have it on the couch for whoever wants to cuddle up with it, but my 11-year old daughter is going to summer camp for the first time ever and I told her she could take it with her. That made her so excited and she said that she can’t wait to show it off to her cabin mates. I’m just hoping that it makes its way back to the couch and not into her room. If that happens, I’ll just make another one since this one was so easy. Now I wonder if she’ll expect me to make her a new quilt every year when she heads off to summer camp! Next up was a yoga mat bag that I’ve had my eye on in the One Yard Wonders book (click on that link to see the review that I did on this book here on Craft Critique). I’ve even had the fabric bought for a year and sitting in my fabric cupboard. I finally got the chance to try it out because the fact that I needed to cut two circles at 6 1/2″ in diameter had me worried that I wouldn’t do it right. Using the Rotary Circle Cutter gave me perfect 6 1/2″ diameter circles to use as the bottom of my yoga mat bag. Pinning the circle was a breeze because the edges were cut flawlessly. I honestly don’t doubt that this fabric would still be sitting in my fabric cupboard indefinitely if it weren’t that I were able to use the rotary circle cutter to finally get it done. Now my poor yoga mat can stay clean in its new bag instead of sitting on the floor of the van at the mercy of the kids’ shoes and the dogs’ paws. I wanted to try out the blade on paper, so I put together a quick shabby chic card using patterned paper and stitching. I cut out several sizes of patterned paper circles on top of a cutting mat. It was a bit different than cutting fabric since fabric has a more give and movement to it than paper does. My first try didn’t go so well since I wasn’t giving enough pressure on the blade. Second time was perfect. Here’s my pile of circles ready to go on a card. The only drawback to cutting paper materials with the circle cutter is that the pivot spike does leave a pin hole right in the center of your paper circle. Here’s my finished card. A simple stamp with some brown ink on top of one of the circles completed my card. My last project was a felt covered journal. As you can tell, I like the look of overlapped circles, so that’s what I did with this journal. I cut out different-sized felt circles, combined with some really small circles that I cut with a die cut machine, and then hand stitched them onto the felt. The cutter sliced through the felt like a hot knife through butter. The Rotary Circle Cutter retails for $26.99 and can be purchased on the Olfa website. Replacement blades retail for $7.99 for a pack of two blades. If you’re looking for a rotary cutter that cuts larger than 8 1/2 inches, there’s also the Heavy Duty Compass Circle Cutter. Regardless of the few cons that I found, overall, Mama likey! This will definitely become an indispensable tool in my craft room. I’m already planning some other projects that I want to use this on: bean bags, pincushions, round potholders, and more. With some adult supervision (after all, that blade and pivot spike are SHARP), my daughter and I are going to have some major sewing fun with this tool. Cuts easy and perfect circles every time. Ratchet handle for smooth cutting and cuts with one fluid motion. Designed for left and right-handed crafters. Cuts cloth, leather, paper, vinyl, film, wallpaper and more. Blade and pivot spike both have safety guards. Olfa has a “forever guarantee” on their products. Super sharp and durable stainless steel blade. Measurements on handle are only marked by lines, but do not include inch or centimeter numbers. Product only comes with a small photo diagram on the front of the packaging to show how to use the product. For more information on how to use this product and how to change the blades, you need to access a video demonstration and PDF file on the Olfa website. This is a disadvantage for those without internet access. Pivot spike leaves a pinhole in the center of any paper materials you cut. How do you cut circles? Does the Olfa Rotary Circle Cutter look easier than your current system? One comment per person per article (this is the fourth of four, over a two-day span), please. Winners will be chosen on Saturday, July 9, 2011.